Kansas City Aikido School practices Aikikai Aikido. Aikikai Aikido follows the original teaching of Osensei Morihei Ueshiba, founder of Aikido. Akira Tōhei, who studied under Ueshiba, taught our instructors Larry and Roy Graham. 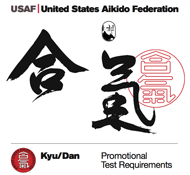 We are affiliated with the United States Aikido Federation. At this time our dojo is NOT offering instruction to children under the age of 16.